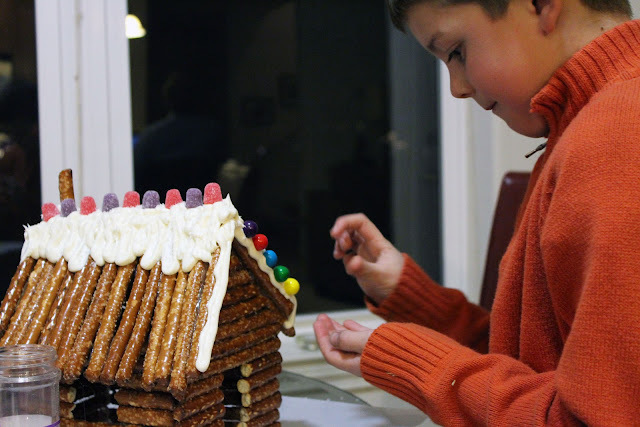 While we were baking the gingerbread houses this year, my son said he wanted to make his gingerbread house out of pretzels. 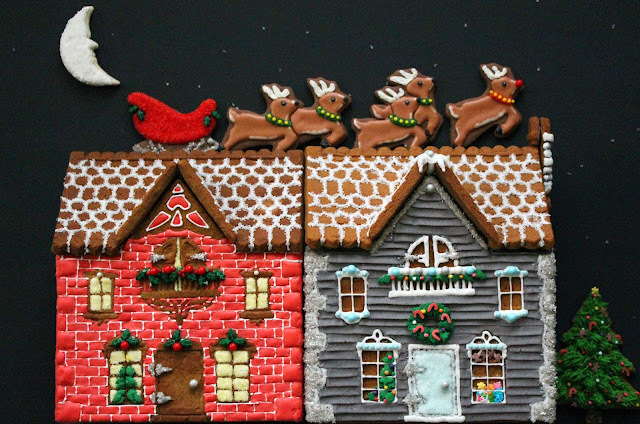 Not everyone has the time or patience in the kitchen to mix gingerbread dough and the gingerbread kits you buy from the store can be a little boring year-after-year. These pretzel cabins are a fun alternative to the standard gingerbread house and the more rustic look makes it feel like something you'd come along while snowshoeing through the woods during the holidays. 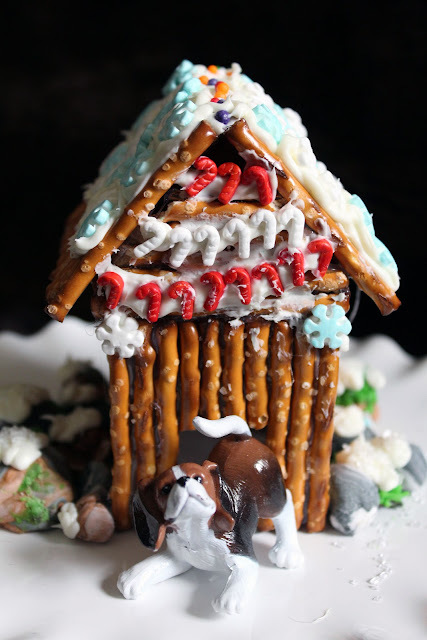 Welcome to our holiday ranch: pretzel cabin, pretzel barn and pretzel doghouse. The decorations: gumballs, M&Ms, spiced gumdrops, red hots & sprinkles. 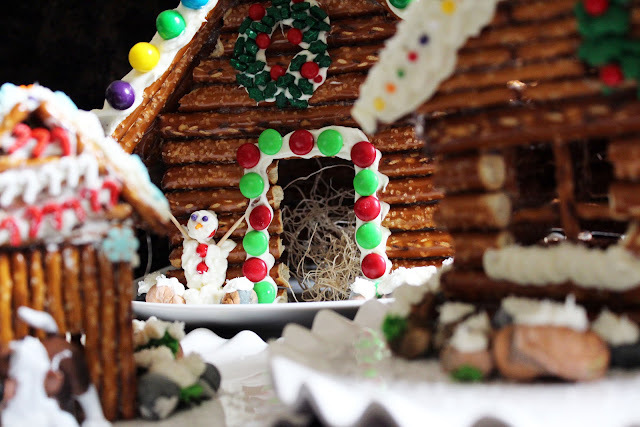 This isn't a project that we intend on eating, so I'm not concerned about it being edible. 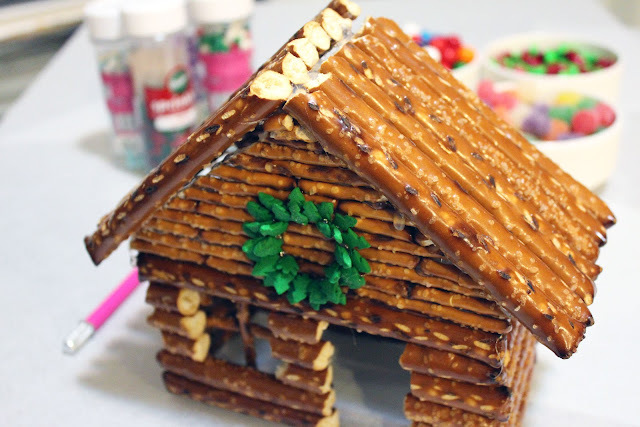 If you would like to make it edible, you can use melted chocolate or royal icing. Supplies: rod pretzels, pretzel sticks, hot glue gun & sticks, serrated knife to cut the pretzels to length. I found it was easier to cut the pretzels to shape/size once they were already glued together. The pretzels seemed to crumble less this way. 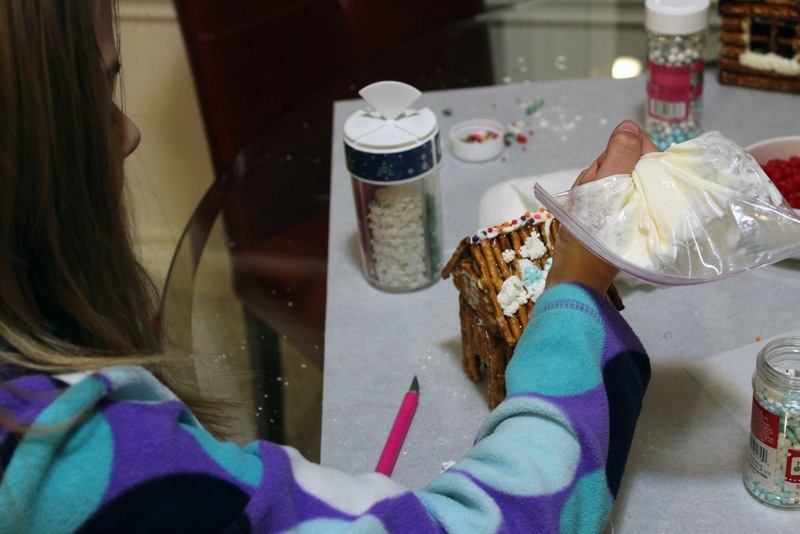 The construction using hot glue went much faster than using poured sugar or melted chocolate or royal icing. I can be crazy directive when the kids are helping me decorate cookies or a cake. Not this project. This was all about them. 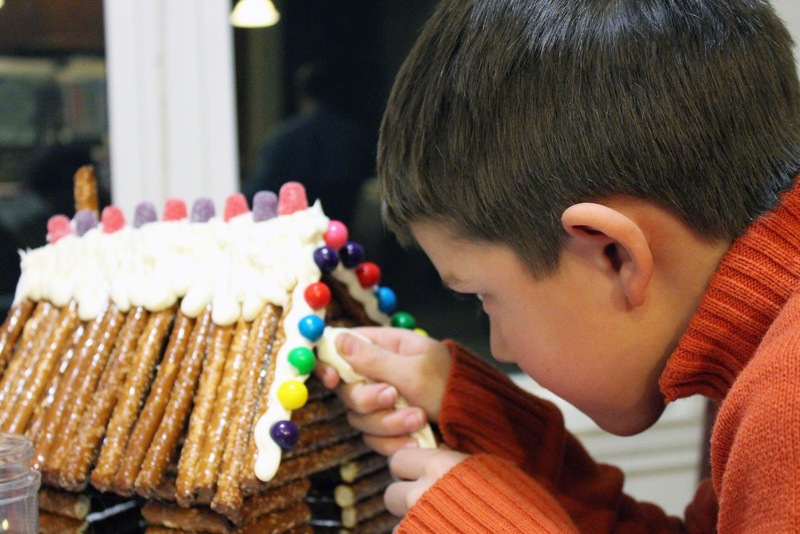 They carefully piped and placed their candy details with the tweezers..."just like Mom". At first, the kids argued over the barn. 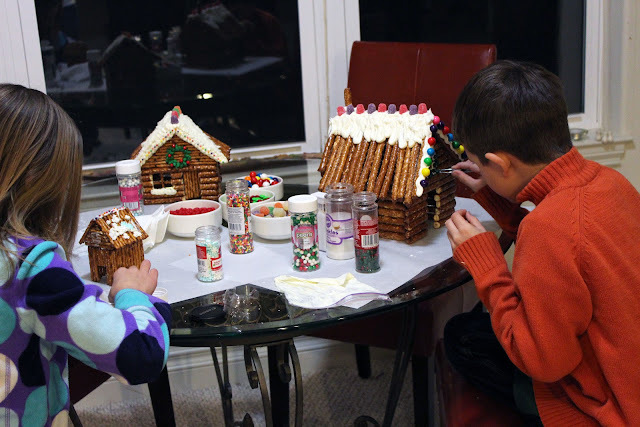 They both wanted to decorate the largest structure and I didn't have enough rod pretzels to construct another one. 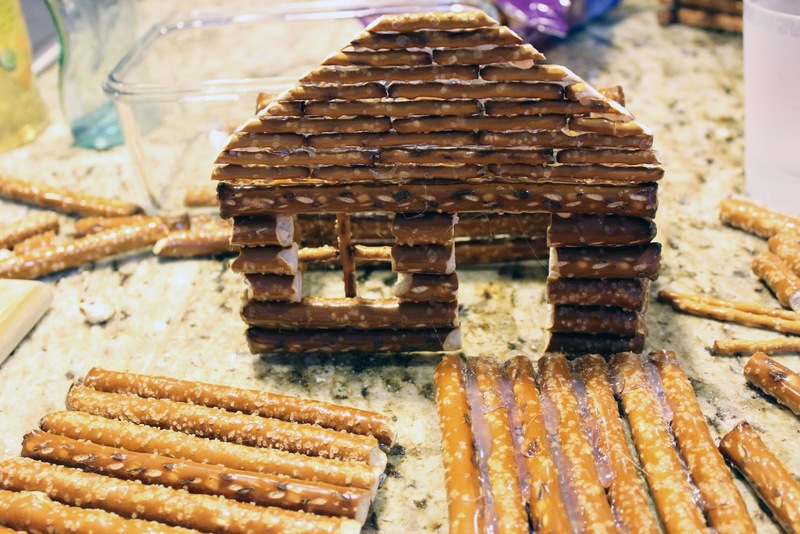 I offered to make a doghouse with the pretzel sticks- which immediately appeased my daughter. She wants to open a pet shop bakery one day. 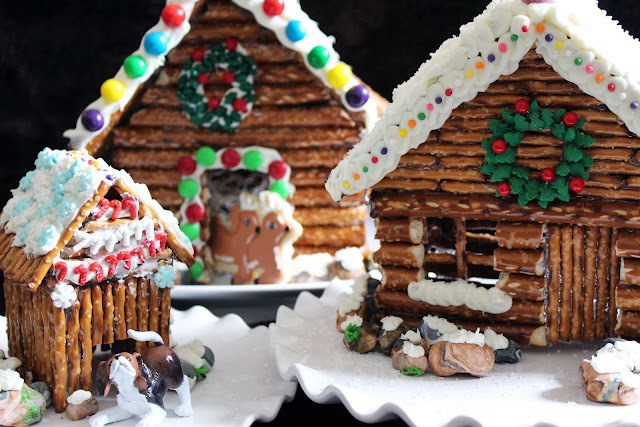 Gingerbread houses have become our little family tradition over the years, but we all agreed that we liked the pretzel cabins just as much...if not more. For instruction on these more traditional gingerbread houses, click here. how do you make the boiled sugar? I have never heard of this. A cup of water and a cup of sugar. Boil down to clear and sticky! You'll know! Hope this helps! what did you use for the wreath over the door? Sugar in a pot heat up ti the sugar is more like syrup, then use that as a glue. ; Be very careful, because it is HOT!!!!! 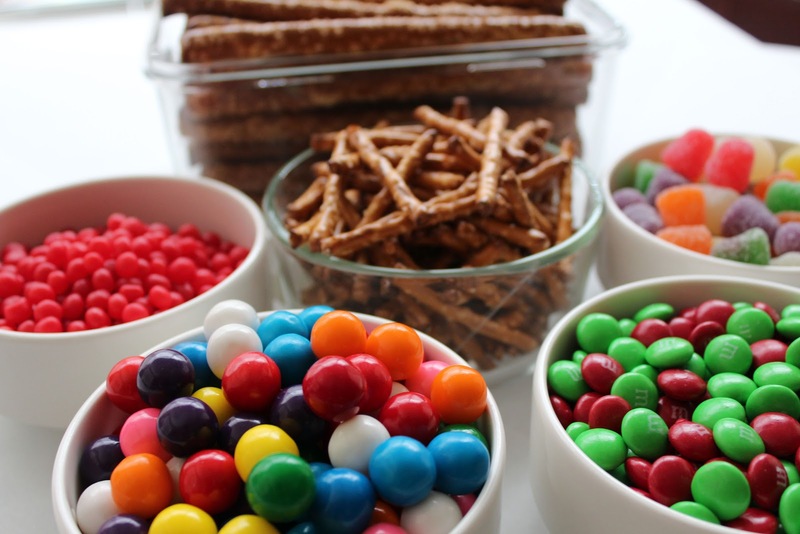 Pour granulated sugar in a pot, heat slowly to "soft ball" stage (if you dont have a candy thermometer, drop small amount into cold water and pull out. Should be plyable and sticky). Just heat some white sugar in a shallow pan until it melts. Keep kids far away. Dip pieces in and stick together. If the sugar in the pan starts to harden, add heat. Soak the pan in warm water afterward. The sugar will completely dissolve. Thanks for posting the instructions, Jeremy! These are cute! Congratulations for such a nice blog! These are fantastic. 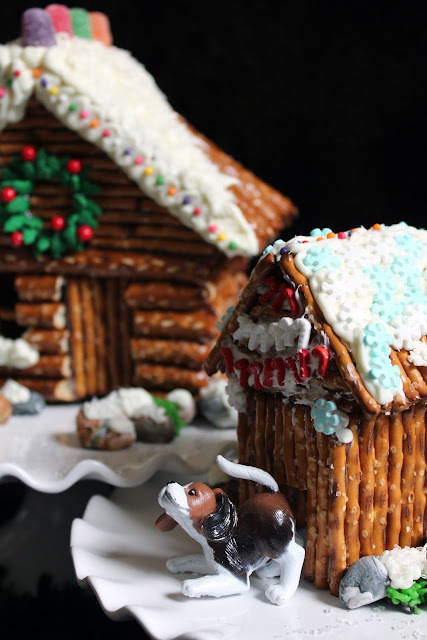 I think I prefer the log cabin-y look of the pretzel version to the gingerbread version. Very nice, congrats to all of you. Pinning! Wow, these are awesome. So beautiful and rustic but realistic too. Hello! Thanks for linking up at Submarine Sunday! 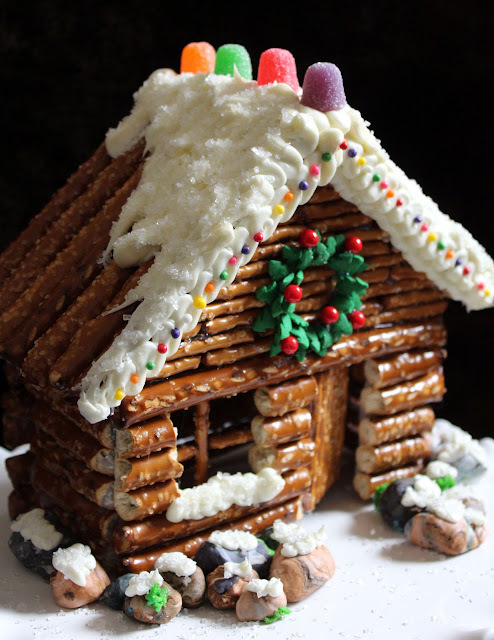 I just wanted to let you know that I featured your pretzel cabins at this week's party! 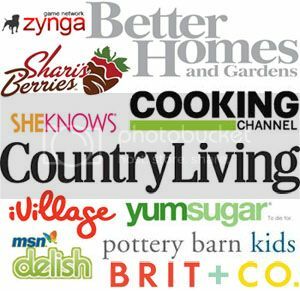 Stop by and grab a featured button and please link up again soon!!! I made these years ago and used a glue gun too. I felt like I cheated, so glad to see that I am not the only one to us the glue gun. Pipe out melted chocolate onto wax paper covered cookie sheets. 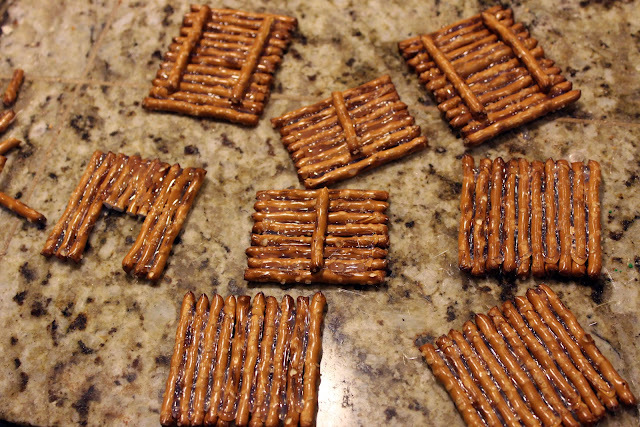 Lay ht pretzels in the choc and chill for 10 min or so...they will be just as firm, still edible and way less difficult than boiled sugar. YUM. Great idea. Melt Almond bark in white for that snow covered or chinking look. This looks very much like fun. If I do it I think I will use Royal Icing for the glue. You can change the color to any color you want from brown to look like mud to leaving it alone to look like snow and it gets very hard when dry. It is also edible. I have done the sugar cube items and I have also used cardboard and whipped wax also years ago and that was fun too. 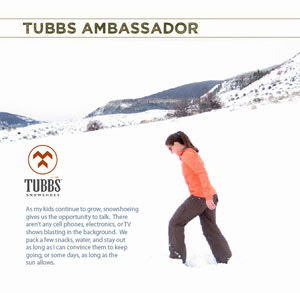 This sounds and looks like a fun project. I would use Royal Icing for the glue and it would be great as you can change its color for various parts (brown for mud, white (natural) for snow) and if you wanted some winter flowers you could make them too. 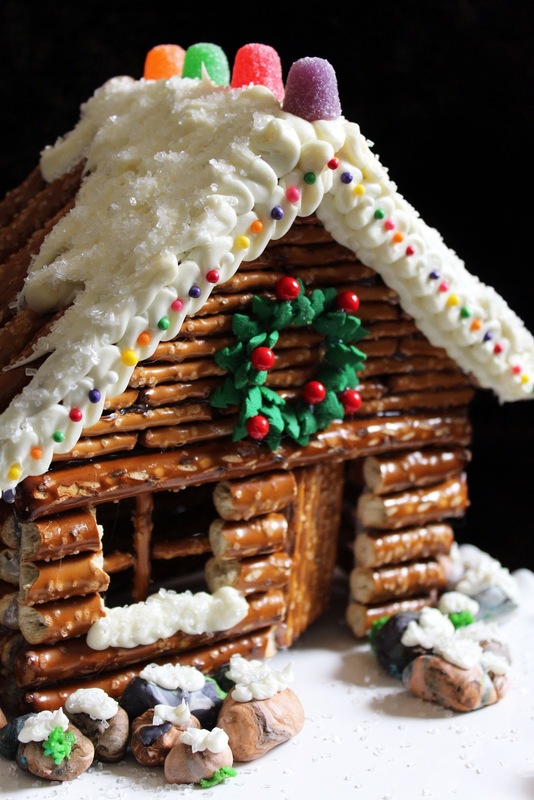 I have done the sugar cube items and cardboard and whipped wax in the past so now I think pretzels is my next project to try. That is really beautiful! 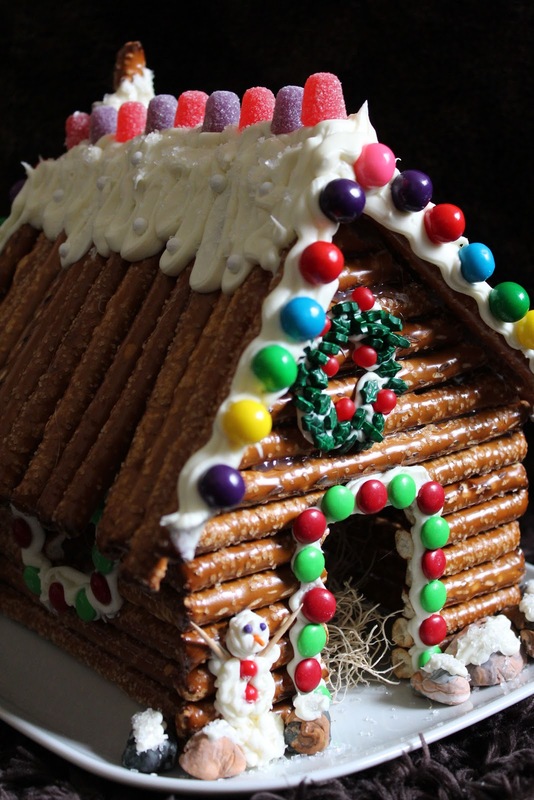 I am afraid if I tried this mine would look more like a condemned house! Good Job! So very cute! I love this idea! Pinning for later! 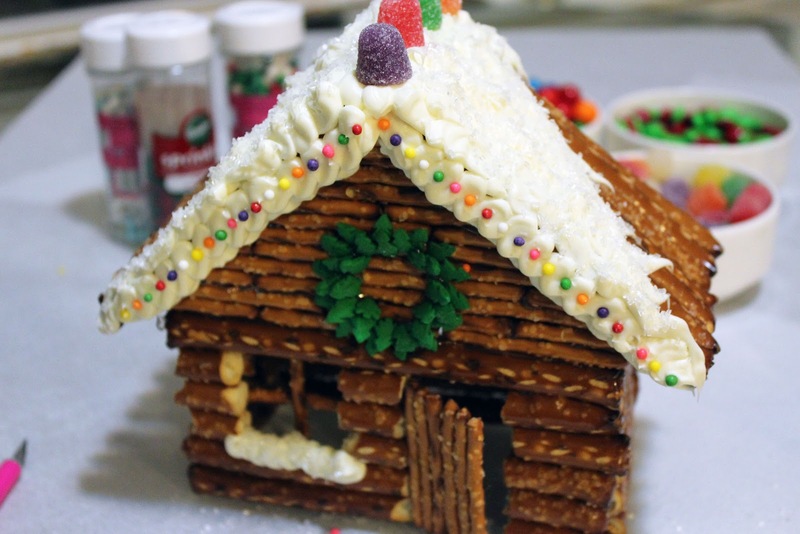 What icing did you decorate with? Awesome! I'm adding this post to a blogpost I'm doing of some compiled links of ideas to do at Christmastime. Is it okay to include one of your photos with the link as well? So cute! I am including this post in a list of Christmas activities for kids. is it okay to use an image as well? Thanks! I might actually be able to make these!!! Omgosh, these are just too cute! I have to make these! I love pretzels too. Pinning! These are WAY adorable!!! What icing did you use for the snow? Melted white or milk chocolate coated on the back of the pretzels and than quickly chilled in the freezer should make them very quick to harden and tastes soo good on pretzels too! any comments on how to get them to best stick together and remain edible? Chocolate, melted sugar. Love these! PLEASE fill us in on what you used for the wreaths. I love the fact that you used a hot glue gun! Who would want to eat anything handled so much w/flu season going on? I am so doing this!!!! Thank you! Awesome! Some people get so bent out of shape over me not making it to eat.